Unassuming and down to earth best describes this 64 year old who clothes almost all top politicians including four chief ministers and the President of India. With no training in design he started his career as a Bollywood designer (designing mostly for villains in over 200 films) and then for the political class. 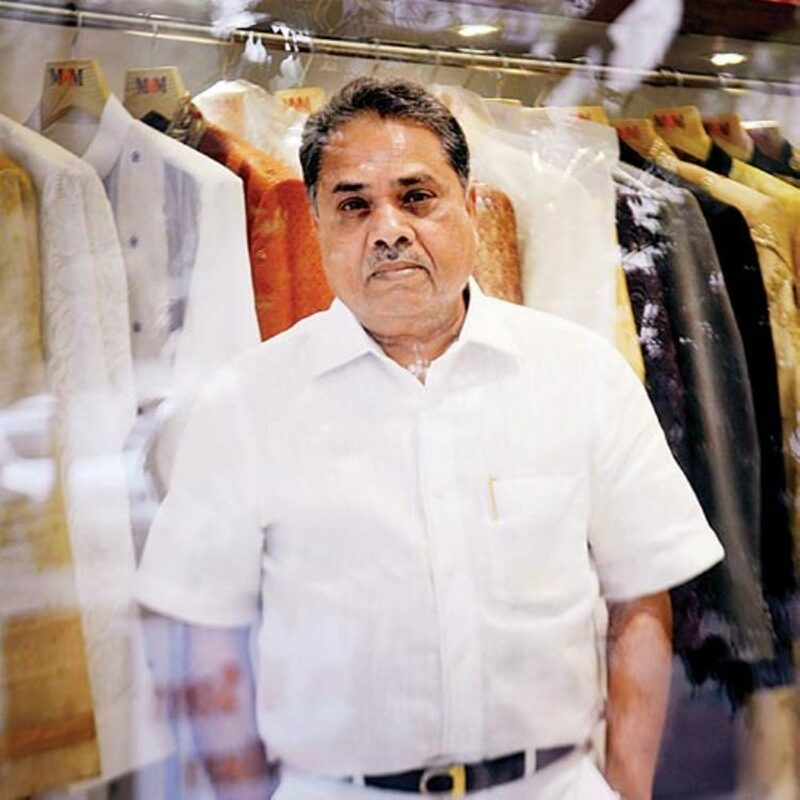 Meet Madhav Agasti the most sought after designer by the political class of India. You have no formal training in tailoring and design. How did you start? I was always passionate about tailoring. Back in my home town in Nagpur I started stitching shirts for my class mates when I was 15. I learnt by just observing and working with the tailors in my village. Initially the shirts would get spoilt. But my friends didn’t mind. I would convince them that it looks nice on them! In college I would stitch clothes for my professors. That’s remarkable. How did Bollywood happen to you? As all young men I too wanted to make clothes for Bollywood stars. 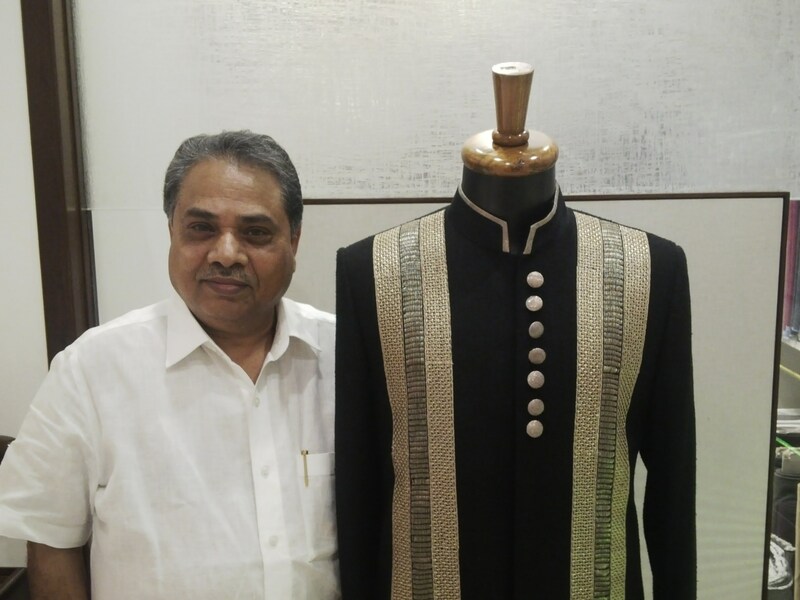 Luckily my first job after landing in Mumbai in 1973 was with Super Tailors – Bollywood’s biggest dress designers then. This is where I was introduced to Bollywood. I would do everything here – deal with customers, take measurements, cut the fabrics, etc. I worked with Sunil Dutt, Ranjit, Danny Denzongpa, Madan Puri, Om Shiv Puri, Shatrughan Sinha, Kiran Kumar, and many more. I was the get-up specialist for villains. From Salman Khan to Aamir Khan, Jackie Shroff and Govinda, I designed for all their first movies, through the 1980s. After working there for around seven months I launched MMM (Madhav Men’s Mode) in Dadar in 1975 with an initial investment Rs 1.5 lakh. With a staff of six tailors I would personally buy all the fabrics, cut them and give it to the tailors. After lunch I would visit the studios to take orders, measurements or deliver finished garments. I worked in Bollywood till 2001. Welcome was my last film. Now my sons Rahul and Shantanu are involved in designing for Bollywood and hence I have taken a backseat. You have had a long association with Bollywood. What changes do you see in Indian cinema today vis a vi costumes? There are no costume based movies anymore. It’s more styling oriented. But that’s what people want – they want to see their heroes and heroines as someone who is like them, only more stylish, aspirational and fashionable. Characters like zamindars dominated the film industry those days. The villain was always rich and his clothes had to reflect that. They dominated even the film posters and commanded as good remuneration as the hero and sometimes even more! Now a days there is no concept of villain! I was introduced to boxer Muhammad Ali by the late Sunil Dutt. He used to stitch suits for him and have it delivered to him. He visited my store twice. How and when did the political association begin? My association with politics began with Narendra Salve and Jawaharlal Darda who I used to tailor garments for. Then I was introduced to Sushil Kumar Shinde. That set the ball rolling. Today I design for almost all politicians in India including Prithviraj Chavan, Farooqh Abdullah, MM Joshi, Sanjay Nirupam, Ajit Pawar, JD-U leader Sharad Yadav, Praful Patel, Rajnath Singh, Murli Manohar Joshi, Nitin Gadkari, Yashwant Sinha, Ravi Shankar Prasad, Shahnawaz Hussain, PA Sangma. You can say almost all politicians except Narendra Modi and Arvind Kejriwal. I visit Delhi every week to discuss styles and fabrics with netas. Currently I design for four Chief ministers – Prithviraj chavan of Maharashtra, Raman Singh of Chhattisgarh, Shivraj Chauhan of Madhya Pradesh and Nitesh Kumar of Bihar. Tell us something about how fashion in the political aisles has changed. In the good old days politicians would stick to dhoti kurta. They wore whatever you gave them. Now everyone is so well turned out. With the advent of television and the media boom, looking good at all times has become imperative. The fabric preference has changed from Khadi to linen and more recently coloured linen. Interestingly coloured clothing started in Maharashtra Vidhan Sabha. Ajit Pawar and Harshvardhan Patil started the trend of wearing coloured kurtas. 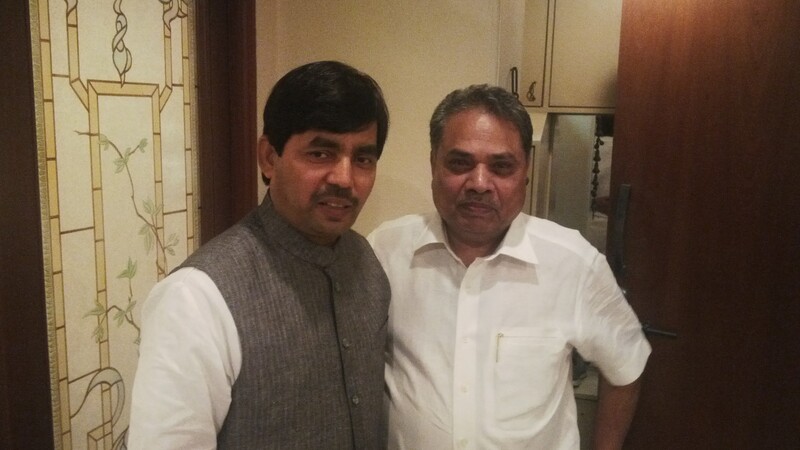 The trend of jackets was first introduced by Manohar Joshi and Gopinath Munde. While designing for the political class I have to keep in mind the protocol of the event. Like for instance if it’s for 26th Jan I have to stick to black and off white. During elections campaigns I make a lot of cotton and khadi kurtas. What makes you the most preferred designer for the political class? Designing and tailoring is all about specialisation and personalisation. You may be the best tailor in the world but you may not be suited for all. There are people who want their sherwanis to be stitched only by me and then there are some who prefer my elder son Rahul. It’s is all about preference. Everyone needs that one special person. Moreover I am preferred since I am out of the limelight. They trust me more since I am discreet. What changes do you see in men’s fashion today? Change happens every decade. Fashion repeats itself every 10 years. Bell bottoms ruled from 1974-1985. Everyone from Bollywood to the common man wanted a piece of it. The bell bottom pants revisited a few years later but it couldn’t sustain. Currently bandis worn over short kurtas and breeches are very in. Short kurta paired with chudidar and jacket has really caught the imagination of people. It also looks nice. Loose is out. In the 70s tight pants were a rage and I see it coming back. The fitness wave is seeing people opt for fitter silhouettes to show their worked out bodies. The only difference being – today’s generation prefers to call it ‘Slim Fit,’ as against ‘fit tight.’ Nehru jackets are extremely popular among political class. A dearth of good raw materials such as buttons, zippers, interlining, canvas, etc is a major issue in India. We prefer sourcing these from Germany. Finding good labour is the most difficult thing in this field. There is a serious dearth of skilful cutters and tailors. The number of people who entered this line from Bihar, Uttar Pradesh and the south has gradually declined. The work being very skilful also keeps people away from it. The craze for ready to wear garments has only added to the problem. But I can foresee people getting back to this field in a few years. The trend of made to order will come back. The current design school pass outs are not very strong in cutting and sewing, though designing is their forte. Its only when you deal and measure different body types that you will be able to stitch for them. It comes with experience. Tell us about your clients outside of Bollywood and the political corridors. Boxing legend Mohammad Ali used to be a regular client after Sunil Dutt introduced me to him. He was a great human being and even visited my store twice. I would send his black suits to him in London. Lastly what’s your secret to success? All credit goes to my family, especially my wife who never bothered me with the household things. I was free to concentrate and pursue my career. When you know that your home is well looked after you are free to soar. I was lucky that I turned my passion in to a career, a business. When that happens everything falls into place. I am 64 now. I will continue to work till the time people call me. When they stop, I will too. We are working on a new concept of travelling tailors where we will travel to the client’s home for the designing needs. I worked with him for 30 years. I introduced him to white shirt style kurtas and narrow pants. He started the trend of cuff kurtas. His was very fond of shawls. I would have his shawls especially made in Kashmir and delivered to him. He preferred only white or off-white and no other colour. The late governor of Maharashtra was a very stylish man having lived in London. He was so humble that he would insist on visiting the store for the measurements. He preferred double breasted suits. He was very friendly. I have been working with Advaniji for the last 32 years. He loves wearing dhoti and kurta with a 3-button jacket. I have recently made a 3-button jodhpuri for him. He likes all colours. He prefers shirts and trousers in white. Suits in black, navy blue and grey are his other preferences. He is a very simple man. He loves a good fit and prefers dark coloured jacket in navy blue, grey and black. A flamboyant dresser, he likes jackets with piping along the collar. He loves coat safari suits that’s cut stylishly.